Generally cloudy. Slight chance of a rain shower. High around 65F. Winds SW at 5 to 10 mph.. Partly to mostly cloudy. Low 47F. Winds SSW at 5 to 10 mph. In this image captured by Drew Shearer's Stealth Cam on Aug. 20, four mountain lions can bee seen lounging by a small creek in the Eight Mile Creek drainage east of Florence. Bitterroot National Forest biologist Dave Lockman surmised that it is an adult female and three older juveniles. This image recorded in September shows a group of what appear to be feral horses. The mountain lions hung out at the creek for several minutes. One of the lions appears to look straight at the camera in this frame. Shearer said the Stealth Cam often takes pictures of nothing when the wind blows a branch too much. An elk peers at the feral horses from a short distance away. FLORENCE – A Bitterroot Valley bowhunter using a remote motion-detecting camera has inadvertently captured some astonishing images of wildlife in the Sapphire Mountains that would make even professional wildlife photographers lick their chops. Drew Shearer of Florence has been using his Stealth Cam (a type of camera often called a “game cam” or “trail cam” by hunters) for the past few months in the Eight Mile Creek drainage east of town to scout for good places to hunt elk. The camera, which Shearer often locks to a tree deep in the backcountry, is activated by any significant movement and takes a rapid succession of pictures. The images that popped up on the screen when Shearer loaded them on his computer back home were incredible. In one frame, recorded on Aug. 20 at 5:44 in the evening, a family of four mountain lions can be seen lounging lazily by a creek. Three of the big predators are drinking peacefully, and one is lying in a bed of wildflowers, blissfully unaware of the camera recording its every move. The lions hung out at the creek for several minutes as the camera snapped dozens of frames. Shearer’s wife Jill said she actually saw the pictures on the computer first because he was in another room while they loaded, and she freaked out a little. “I told him I never want him to take Dakota (the couple’s 2-year-old daughter) out there with him,” she said. 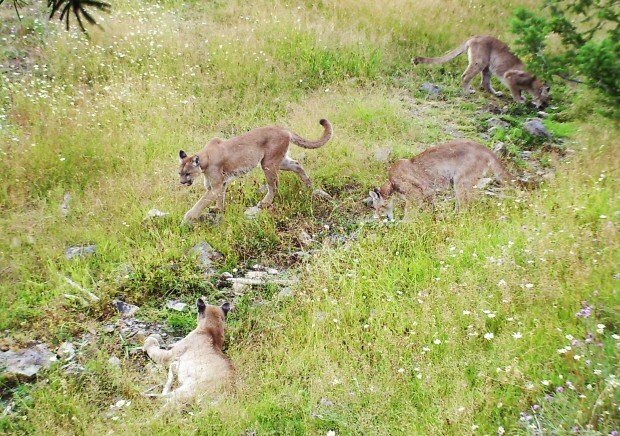 According to Bitterroot National Forest wildlife biologist Dave Lockman, it’s likely that the pictures show an adult female with three older juveniles. 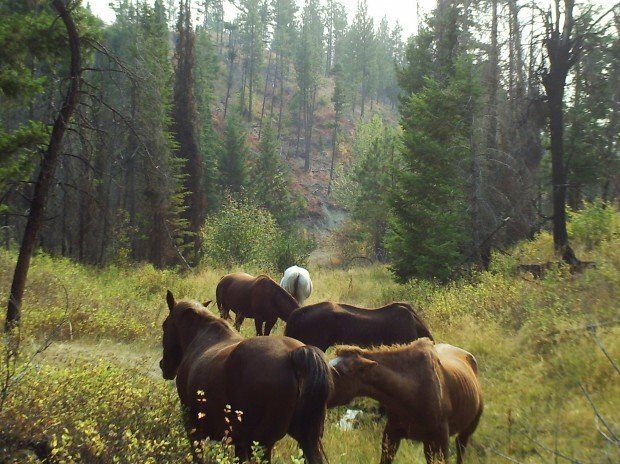 In another group of photos taken on Sept. 28 at about 4 p.m., Shearer’s trail cam captured what appears to be a group of feral horses. None of the horses are wearing a bell and there aren’t any humans to be found. In one of the photos, an elk can be seen peering at the group from a short distance away. Lockman said it isn’t uncommon for hunters in Montana to encounter unattended horses. Shearer, for his part, doesn’t have any ambitions of becoming a wildlife photographer any time soon. “Hell, I usually just delete ‘em if I don’t see any elk,” he said.